Zazzle.com My kid has ordered stuff from there with our company logo. Good quality stuff. I’m going to get her to order me a couple of shirts for work. I’ve heard good things about Zazzle from someone I used to print t-shirts for. When I stopped screenprinting, he offered his shirts through there, and he’s been pleased with the quality, at least the last I knew, which was a few years ago. I kind of want one of the above, too, though. Finish the book and give the t-shirt if you pre-order. You only get a t-shirt if you get the book. But there’s a scene in the bar much, much later in the book when Nita comes in, and somebody says, “Who’s that?”, and Nick says, “That’s the Devil of a Good Time.” I’m pretty sure I’m keeping that scene. Now I want that tee-shirt too. Great t-shirt. I would wear it proudly. Now off to have some kind of fun writing myself. You are such an inspiration! I would totally buy that shirt. Can’t wait to buy the book and the shirt to go with it. This would be a great addition to my growing wardrobe of death metal t-shirts. Oh! I found the Writewell Academy mug on Zazzle. Yay. [waves hand] Love to wear it to the gym. I’d have to work out badass hard. Your publisher is going to love the merchandising/PR opportunity that goes with this shirt. “That’s the Devil of a Good Time.” And is she by then? Oh, yes. That’s at the end. Oh, I want one too! Make them before the novel publication, so the right will belong to you, not the publisher. The right would belong to me since I designed it (with free stuff from the web that would have to be double-checked). I’m looking into it now. Patience, grasshoppers, the image needs cleaned up, and then I’d want to see it printed before I led any of you down the garden path. The t-shirt path. Whatever. I have no idea what book contracts look like, but worth perusing to see if there are any clauses regarding merchandising, etc. This is not my area, but always a good idea to review contracts. My contracts state nothing about merchandising (I read them carefully, as do my daughter and two agents). We’ve done merchandise for Dogs and Goddesses and Agnes and the Hitman with complete support from SMP. They’re great. Um, I will now be scouring the internet for that stuff, unless you have handy a link to that merchandising, please! Or is it too late to buy? 🙁 Agnes is probably my fave. I relate to the cranky, and the house, and the cooking, and just everything. The apron was in the book, it was part of the marketing for Agnes’s book, Mob Food. There are t-shirts on there, too. I will add that the hardcover of Agnes with the white black and red, the checks (as I recall) is one of my favorite ever book covers. But I did go to Zazzle and ogle the Writewell Academy mugs. Oh! I thought I remembered something on Cafe Press (-:. I think merch with a book is a wonderful idea. I haven’t been following “Welcome to Nightvale” this year, but they’ve got a lot of merchandise, plus some of the fan art really blows my socks right off (and into the Dog Park). I think it’d be hilarious to have coffee tumblers with the same image . . . because it seems like the last thing a bar patron would want was a bracing mug of coffee. I can’t decide if it’s more evil to have an 6 oz. mug, or a 64 oz. mug. But I have a weird sense of humor, and only a vague, theoretical knowledge of bars. I think the bars in my hometown are actually civic centers of a sort, and some of them have the best food in town, according to my sources. They may even have the best coffee . . . .
Usually you can put the image on anything they have, so that shouldn’t be a problem. how about a special Jennifer Crusie Charm with your stylized initials for a charm bracelet or keyring. 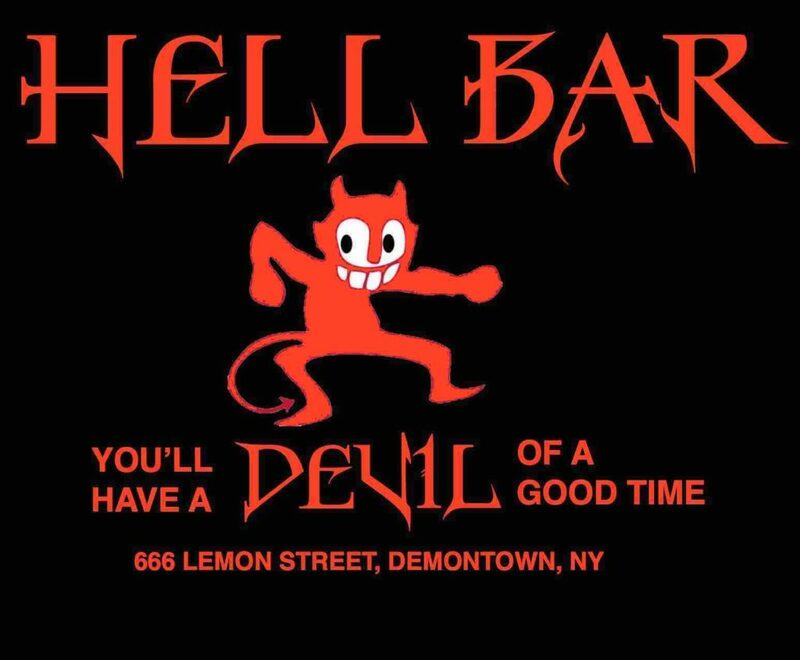 I think if I get the Hell Bar T-shirt done, we’ll be ahead of the game. Cute! I’d buy stuff from a Jenny Crusie Zazzle or CafePress store. I know Gail Carriger has a Zazzle store with stuff that is either series specific or just the type of humor that her fans tend to share. I bet Cherries would flock to your virtual shop.